Bring your family and put-putt your way around an 18-hole miniature golf course set up throughout Darien Library at its 5th annual Mini Golf fundraiser, which takes place both on Saturday, Nov. 17 and Sunday, Nov. 18. Cost: $5 per player — each player will also receive a free hot dog. You can also enjoy face painting and other activities. This one-hole mini-golf set up was by the front desk before a previous Darien Library mini golf event. All proceeds from Darien Library Mini Golf will go directly to the purchase of books, movies, and technology as well as the support of countless programming opportunities throughout the year. This event is organized by the Darien Board of Trustees Fundraising Committee: Alex Eising (Mini Golf Chair), Tori Barnett (Mini Golf Co-Chair), Jay Bennett, Michael Cippoletti, Allegra Erickson, Tammy Sload, and Susan Vogel. Holes are being sponsored by generous businesses and individuals. A special thanks to our Premier Hole Sponsors: Baywater Properties and The Wyper Family. Hole sponsors include The Barnett Family, Carta, McAlister & Moore, LLC, Crescendo Music, The Eising Family, First County Bank, GWAY Printing & Graphics, Houlihan Lawrence, Dr. Maryann Lehmann, Nedder and Associates LLC, Palmer’s Market, Remedy Partners, TD Bank, and The Whidden Family. Tee and Green sponsors include Alan Hyatt Landscaping, The Darien Toy Box, Kumon, Michael Joseph’s Catering, and Pensiero Plumbing and Heating. Our “19th Hole” is sponsored by Chocolate Works Darien, Frosty Bear Café, and Espresso Neat. 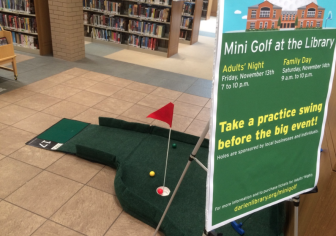 One of the most popular events of the year is back — Mini Golf in the Library! Join Darien Library in the indoor links as it welcomes golfers of all ages and degrees of putting perspicacity.